In a surprising turn of events, former All India Tennis Association chief Anil Khanna has withdrawn his name from the list of possible candidates for the post of the president of the Indian Olympic Association (IOA), which will be vacated by current president Narayan Ramachandran after a rival faction decided to unanimously end his tenure at the top. 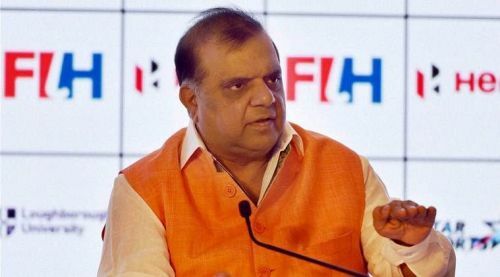 The decision to withdraw his name will now mean that Narinder Batra, who currently serves as the president of the International Hockey Federation, is set to become the next IOA chief. After an opposition party won the majority to bring an end to N.Ramachandran's tenure as the president of the IOA, three bigwigs Anil Khanna, Narinder Batra and Indian Weightlifting Federation's Birendra Baishya threw their hat in the ring for a claim of the top spot. Only a couple of days before the voting period started, IWF's Birender Baishya pulled out of the race which meant that the battle was only between Anil Khanna and Narinder Batra. While most of the IOA committee members declared Batra as the front-runner for the post, the voting through a secret ballot was set to decide the next president. However, Anil Khanna decided not to contest anymore and removed his name from the list, which meant that Narinder Batra will automatically take over the post and will assume office from February 2018. However, the voting is set to continue since Khanna's withdrawal took place after the last date for applications. N Ramachandran will continue to serve as the president of the IOA for the next month and a half before Narinder Batra takes up the position in February, which will see him becoming the 13th president of the association since its inception in 1927. The decision to change the president has come after a gap of two years and Batra's experience and good work with hockey in India could come in handy in IOA.